Made in Summit: Fresh Soap Co.
Name of business or product: Fresh Soap Co. Date business or product was launched: Our Breckenridge store opened in December 2011. What goods do you make here in Summit County? How much do they cost? 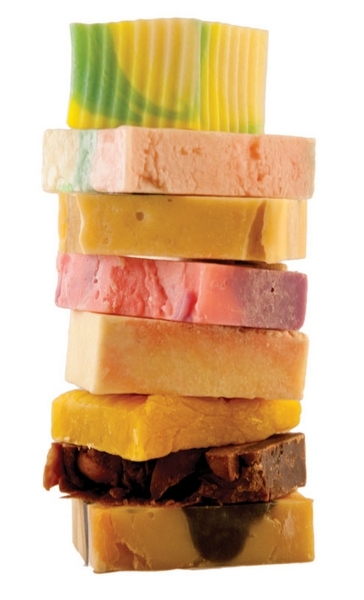 We make both cold-process and glycerin soaps. We only use high-quality, vegetable-based oils and butters to make our soaps, so we can honestly say our products are “natural” and kind to the skin. We never use animal fats or tallows in our soaps, so they are vegan safe, too. The only animal byproduct we use in some of our soaps is goat’s milk for its incredibly mild properties, making those soaps especially suitable for the most sensitive skin. Our soaps are also artistic, each one having its own personality, and they make great gifts for everyone. We spend many hours formulating our recipes and designs and are proud that each piece of soap is unique, so we feel justifiably proud to be an original! Our soaps are mostly less than $8, depending on size, ingredients and weight, and we cater to budget-conscious customers, too, where they can cut their own soap from our “Chip off the Old Block” or choose an off-cut from our “Bargain Bath.” We regularly feature a “Soap of the Month,” which we sell at a discount, so there’s something for everyone! What’s great about making your products here? Since we make our soaps right in our Breckenridge store, we feel our values align with the wholesome lifestyle we enjoy here in Summit County. What could be better than an hour or two on the slopes before coming to work on a new soapy creation! There’s nothing more satisfying than to have a visitor enjoy the beautiful history and architecture of Breckenridge, then to have a positive “experience” when they visit our store and go home with a fragrant bag of goodies they bought from the secret little soap shop tucked away in the corner. What’s new with your company or product? Although our beautiful soaps are our focus, we’ve gradually been introducing new product lines to compliment our soaps and to meet customer demand. We sell gorgeously fragrant bath bombs, natural sea salts, salt and sugar scrubs, bath soaks, candles, bath and body accessories, plush spa robes and slippers, too. Our company is a work in progress, and we are constantly evolving to keep our brand fresh and exciting. We also have generous wholesale terms. Why do you think it’s important for people in Summit County to buy locally made goods? There’s something to be said for locally crafted products, and we need to keep The Multiplier Effect moving by supporting each other. Supporting small business in our own back yard, especially those who make their own products, means keeping America strong. How can people find out more about your products? They can visit our store in Towne Square Mall (corner of Main and Lincoln, by the fire pit) in Breckenridge. Or they can visit us at http://www.freshsoapcompany.com or like us on Facebook (Fresh Soap Co.). They can also phone us at (970) 423-7194. Do you have a product that’s made right here in Summit County? Email kdriscoll@summitdaily.com to be featured in Made in Summit.